REASON FOR BULLETIN: MECHANICAL COIN METER INSTALLATION. RATED AT 12 VDC, WITH A 1N4004 CLAMPING DIODE. 1 .156, 22AWG, 5 PIN CONNECTOR. 1 #22 AWG YELLOW WIRE 48” LONG. * CONNECT ONE SIDE OF THE METER TO PIN 2 OF A 5 PIN CONNECTOR. CONNECT THIS CONNECTOR TO J4 PIN 2 ON THE DIODE PCB. * CONNECT THE OTHER SIDE OF THE METER TO THE 48” LEAD. * RUN THE WIRE WITH THE HARNESS WHICH IS LOCATED ON THE LEFT SIDE OF THE CABINET, THROUGH THE PROTECTIVE SLEEVE BY THE COIN DOOR HINGE. * CRIMP OR SOLDER THE WIRE END TO THE EXISTING LUG LOCATED AT THE BOTTOM OF THE COIN SWITCH. * MOUNT THE METER ON THE INSIDE OF THE LOWER CABINET, TO THE LEFT SIDE OF THE CASH BOX, ON THE WOOD PORTION JUST BEHIND THE CASH BOX. 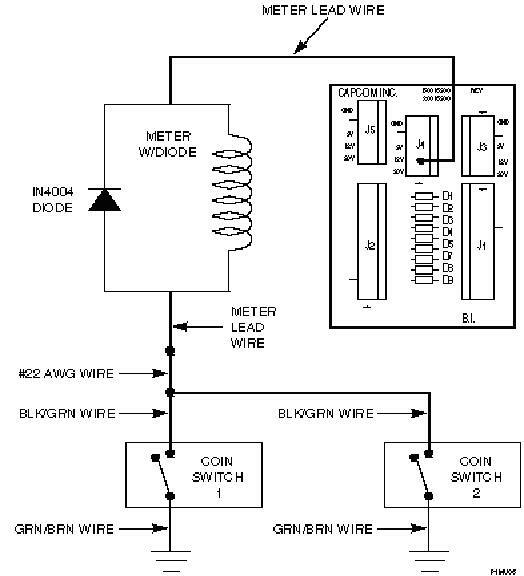 * SEE WIRING ILLUSTRATION BELOW.